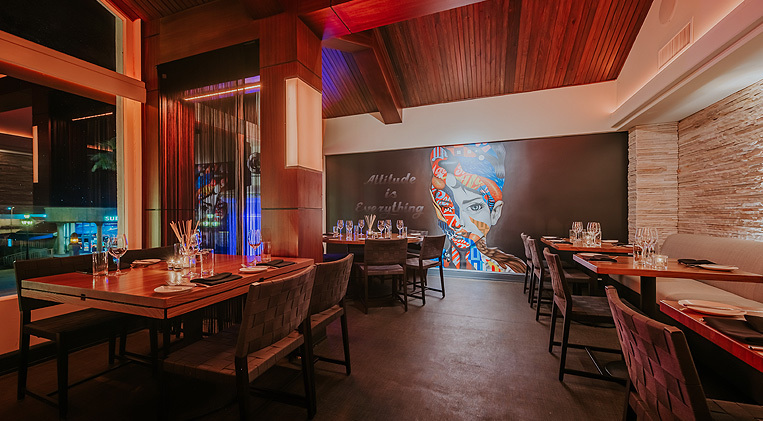 As a timeless signature of Aruba's most thriving downtown district, L. G. Smith's masterfully adds its own upscale flare to the modern steakhouse. Featuring choice, USDA-certified Angus Beef and sundry, mouth-watering appetizers, L.G. Smith's offers every adventurous epicurean an imaginative fine-dining experience that you'll need to taste to believe. Already the #1 steakhouse in Aruba according Tripadvisor, L.G. Smith's Steak & Chop House is well known for its USDA-inspected, aged-prime steaks and house specialties, including rack of lamb and fresh local seafood. The restaurant has added new appetizers, entrees and desserts to its menu and has taken guests' favorites and given them a modern, Americana twist. Some of the chef's favorite new dishes include Foie Gras Duo, Wagyu Tenderloin and The Dome, which represent his vision that "each dish on the menu is thoughtfully plated to accentuate the flavors of the ingredients, allowing the meats and seafood to be the highlight of the meal". Fully embracing the trend of craft cocktails, L.G. Smith's mixologists have concocted new signature cocktails that embody the elements: Water, Fire, Smoke, Earth and Mist. Each cocktail is carefully crafted to perfection and incorporates fresh organic juices, local Aruban aloe; premium whiskey, bourbon, gin, port and cognac; and/or herbs such as lavender, sage and sweet bay leaf, among other ingredients. The Mist is like a complex, rich and sweeter cocktail version of red wine, while the Smoke offers a hearty bourbon flavor infused with the smoke of toasted bacon, and the delicate Fire is finished with a creme brulee rim. The unexpected presentation of each drink is what takes the cocktails to the next level, incorporating all the trends of modern mixology.